SignMeUp is an online event registration platform that supports endurance sport and race events. It is flexible enough to meet broader deployment demands, and also supports charity organizers with fundraising features. At the same time, the app is fully adaptable for adding promotional branding for partners or sponsors. Starting with event promotion and capturing reservations, the solution provides a built-in form builder with a selection of customizable templates and the option to add donation requests, survey questions and more. You can collect credit card paid registration fees without the need for an additional merchant account while cross-selling registrations, memberships, or merchandise for associated events. In addition, the system offers the necessary tools for processing refunds, running referral or incentive programs as well as using customer service questionnaires. SignMeUp also offers member management features, enabling organizers to organize entire membership databases. They can maintain registration histories and member records, while collecting preference or demographic information. You can keep contact details for communicating successful registrations and event news via SMS alerts or personalized email notifications. 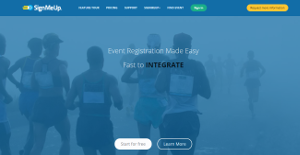 You can use SignMeUp to build responsive online event registration applications optimized for organizers of race, sports, and fundraising charity deployment plus broader applications. On top of that, you can create fully customizable web forms with an integrated builder plus a range of pre-designed, event-specific templates and the option to add donation requests, questions, surveys, etc. Sell memberships, registrations, and merchandise, and accept charitable donations via online credit card transactions without the need for a merchant account. You can manage membership databases and issue SMS alerts or registration notifications, while also operating incentive programs including the application of coupon codes. The dashboard-based user interface with mobile app access gives event teams the ability to log in remotely, search and find registrant details, and view custom reports that provide insights on performance. You can customize your forms with reservations, donation requests, survey questions and more. Use emails, coupons, incentives, referral programs, and social media to make your event a success. Use email for sponsor promotion including coupon promotion, after-registration offers, and logo placement. Enhance registrations with mobile responsive forms that look attractive on any device. The app processes Amex, Discover, Master Card, and Visa cards securely and in real-time. There is no need for a merchant account. You can copy forms or just share questions across forms. Change questions on the fly. Assign multiple team members to your account. Set campaign end dates and more. Create detailed reports and charts that tell a visual story about your event’s performance. Customizable branding for adding sponsor logos, etc. If you are considering SignMeUp it could also be beneficial to examine other subcategories of Best Event Management Software gathered in our base of SaaS software reviews. Enterprises have diverse wants and requirements and no software platform can be perfect in such a condition. It is useless to try to find a perfect off-the-shelf software product that fulfills all your business needs. The wise thing to do would be to customize the solution for your special requirements, employee skill levels, budget, and other elements. For these reasons, do not hasten and invest in well-publicized leading systems. Though these may be widely used, they may not be the best fit for your unique requirements. Do your research, check out each short-listed application in detail, read a few SignMeUp reviews, contact the vendor for explanations, and finally choose the application that presents what you require. How Much Does SignMeUp Cost? SignMeUp enterprise pricing is simple. Build your registration forms for free. Only pay when people register. The vendor doesn’t get paid until you do. SignMeUp’s service fee is 6.75% + $1.25 (minimum $2.75 per registration) and includes all credit card and check processing fees. You get customer support for free. Plus, you have the option to pay the fee out of the registration proceeds or pass the fee on to the registrant. For more information contact the vendor and get your form up and running. We realize that when you make a decision to buy Event Management Software it’s important not only to see how experts evaluate it in their reviews, but also to find out if the real people and companies that buy it are actually satisfied with the product. That’s why we’ve created our behavior-based Customer Satisfaction Algorithm™ that gathers customer reviews, comments and SignMeUp reviews across a wide range of social media sites. The data is then presented in an easy to digest form showing how many people had positive and negative experience with SignMeUp. With that information at hand you should be equipped to make an informed buying decision that you won’t regret. What are SignMeUp pricing details? What integrations are available for SignMeUp? If you need more information about SignMeUp or you simply have a question let us know what you need and we’ll forward your request directly to the vendor.